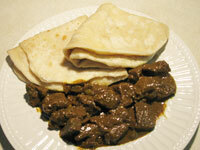 Beef is such a versatile meat, it can be cooked in any manner. Curry Beef on the other hand is done only one way. This recipe is so wonderful you can eat it without anything. It is especially excellent with Dahl Puri. Clean beef, remove bones and cut into bite size. Wash gently with cold water and set aside. Chop onion, garlic and celery (do not blend). Add all other ingredients except beef, potatoes and oil. Mix in a bowl with 1 cup of water. In a pan or pot add oil and heat. When the oil is hot add mixture and stir for 5 minutes. Then add 1 cup of water and allow to boil/fry on low heat. Clean and peel potatoes, cut into quarters and set aside. Add the beef to the pot and stir. Cover this for three minuets then stir it again until most liquid has evaporated and the beef is no longer pink. Serve hot over rice. Can also be served with Roti or Dahl Puri.